ARUNACHAL Pradesh is one of the greenest states in India. Yet today, despite having only seven persons to a square kilometre and about 8.4 million ha of rich vegetation, the state is gravely threatened by deforestation. Forest officials claim an almost 14 per cent increase in forest cover between 1980 and 1987. About half this increase can be attributed to the inclusion of areas which satellite images could not analyse before because of cloud cover. But it still means a real increase of 4,87,000 ha. But the situation on the ground is far from happy. A large part of the state's revenue is generated directly from its forests. A note prepared by the Arunachal Pradesh Forest Corporation (APFC) in March 1988 states that "90 per cent of the state's direct revenue is generated by its forests besides indirect revenue in the form of allocable excise duty available mainly through the plywood industry". With few opportunities for growth, the state has become heavily dependent on external assistance. Only 0.7 per cent of its total revenue comes from within the state, while as much as 90 per cent comes from the Centre. The per capita share of plan investment for an Arunachal Pradesh tribal, at Rs 8,511, is the highest in the country today, way above the national average of Rs 1,493. 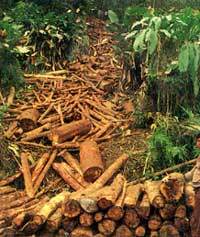 Despite this, only a small minority of the tribals have profited from the lucrative timber trade. With no industrial base to speak of, more than 75 per cent of Arunachal Pradesh's population is dependent on agriculture for their livelihood. A few get government jobs, thanks to reservation quotas, or find employment in the transport and communication sectors. Clearly, the easy road to riches is through timber operations. It was during the 1980s that forestry emerged as one of the major contributors to the state's net domestic product (NDP), its share rising from 12 per cent in 1980-81 to around 20 per cent today. The road construction sector, the most organised enterprise in the state, serves to provide better access to hitherto untouched forests. The growing demand for timber has created an elite which wields immense political clout. Forests have become so valuable that not only are the state government and the local elite vying for greater control over them, but neighbouring states have also laid claims to them. This has heightened social tension in the area. When market forces initially penetrated the forests of Arunachal Pradesh, a situation akin to the California gold rush was created. In 1988, it was proposed at a conference of state forest ministers that the Arunachal Pradesh government concede to a ban on timber operations. The loss in revenue, estimated at Rs 80 crore, would be met by the Centre. But the proposal was turned down by the state. This is not surprising considering the strong timber lobby in the state. Between 1970 and 1985, the number of saw mills in the state rose from 15 to 67, while plywood units increased from five to 13. The constantly rising demand for veneer, sleepers and other industrial products from wood aided in the faster depletion of forest resources creating, in the process, a serious raw material crunch. Today, about one-third of the total installed capacity of Arunachal Pradesh's plywood industry is unutilised. The Norbu saw mill in Shergaon, West Kameng district, is now using only 50 per cent of its installed capacity. The Mamang Borang saw and veneer mill in Pasighat remains functional for only 200 days in a year. The plywood mills in Deomali have even started importing Malaysian timber. Almost all the timber units are concentrated in the Tirap and Lohit districts, which has all but destroyed the hollock (Terminalia myriocarpia) and hollong (Dipterocarpus gracilis) forests unique to this region. The soft wood of the hollong makes it eminently suitable for making plywood. As a result, the tree has been subjected to ruthless felling. So extensive has been the deforestation here that it is feared that the hollong will become extinct in another 10 to 15 years. Nahar (Mesua ferrea) is another dominant component of the wet, evergreen forests of eastern parts of the state. These trees have been ruthlessly cut down to make railway sleepers. Between 1982 and 1984, 40 per cent of sleepers were supplied by these nahar forests. Illegal felling The acute shortage of timber, escalating prices and attractive profits have had one definite fallout: increased illegal felling of trees. Timber from Arunachal Pradesh has a ready market all over India, especially in Delhi. For the 1982 Asiad, Rs 200 crore worth of timber was sent to Delhi from the state. Timber is also a political asset in the state and has spawned a great deal of corruption. In July 1989, the opposition had even alleged that chief minister Gegong Apang was granting "saw and plywood mill licences to the opposition MLAs to lure them to join the Congress". The then vice-president of the state Janata Dal, Norbu Thangu, accused the state government of "living by selling tree permits". More recently, the ministry of environment and forests has received reports about the involvement of top officials in the destruction and plunder of the region's forest cover. On the basis of this, an inquiry was ordered by the minister of environment and forests, Kamal Nath. He is now scrutinising the report. Corruption manifests itself in different ways. A tree plantation cultivated as part of a social forestry project near Ganga Market in Itanagar was cleared to make way for a shopping complex under "minister's orders". In January 1991, confiscated timber worth Rs 40 lakh was discovered near a forest checkpost near Zero Point in West Kameng district. Ingenious ways have been found to evade rules. As a tribal in Daporijo revealed, often the girth sanctioned in a permit for one tree is used to smuggle through many trees of a smaller girth, logged together to make them appear a single tree. Even without such ingenuity, more trees are felled than permitted. In 1990, about Rs 22 lakh was collected as fines for illegal logging in the Pasighat forest division alone, according to local sources. Tree permits are routinely issued to those holding rights for the felling and sale of trees. Prior to 1980, the divisional forest officer was empowered to approve the number of permits to be issued in accordance with revenue targets. Since then, the quota system was introduced to check the alarming rise in felling. Every year, the state cabinet fixes the number of permits to be issued and quotas are allotted to different forest divisions. Nevertheless, the timber lobby very often succeeds in thwarting the forest department's rules by applying political pressure. In the Bomdila forest division, the number of permits issued prior to 1990 varied from 50 to 86, but in 1990-91 as many as 200 permits were issued. The denuded slopes of Bomdila, capable of supporting only shrubs and chir pine trees, do not merit such an unprecedented rise in permits. In some forest divisions, the total quota of permits is equally distributed among the various electoral constituencies, with the local MLA deciding the final names, rather than the divisional forest officer. Unfortunately, resistance to such practices, apart from isolated voices of dissent, has been few and far between. In the summer of 1990, for instance, group violence broke out in the forest division of West Kameng district when the villagers of Khupi stopped the movement of logs through their territory in a bid to stop the timber operations of the Pallizi saw mill. Technically, only local people are allowed to hold tree permits and licences to set up saw and plywood mills. But in practice, outsiders buy up these licences or enter into partnerships with licence-holders. Today, the entire timber economy is being run and managed by entrepreneurs from outside the state. Although the local tribals are making a lot of money out of these ventures, the lion's share of the profits is flowing out of the state. But chief minister Apang sees this as a "transitory phase". "Our people are poor and do not have enough money for investment. Therefore, we will have to let outsiders come in with their capital. A time will come when we will be able to manage our industry on our own," says Apang. But other government officials are not so optimistic. In fact, there is concern over new forms of social tension in the area. Some of the saw mills located near the reserve forest are allotted quotas, but those located in the unclassed state forest area are entirely dependent on tree permit-holders for their raw material. Timber merchants who have come from outside the state and have made large investments, are very unhappy over the operational constraints on their trade. Their legal status within Arunachal Pradesh is that of managers. If the actual owner of the enterprise -- the permit-holder -- decides to take over the business, the person who has actually put in the capital cannot demand its return legally. While local tribals may not resort to such measures as yet, their demands for money and services have been steadily increasing. Saw-mill owners in the West Kameng district complain that they have to often provide vehicles, free of cost, on social and ceremonial occasions as well as for general transportation. On an average, mill vehicles ply on the roads for about 160 days in a year to cater to this "public demand". They also have to provide timber free of cost to the villagers. Complicated ownership claims over forest land are another source of tension in the area. In the Apatani valley, forest land is becoming increasingly privatised. Local tribals are now asserting hereditary ownership rights over the forest area. Vast tracts are now being claimed as individual property where even other villagers are denied entry. Boundary disputes, often leading to violence, have become commonplace.
. Forest officials feel that customary laws make the management of unclassed state forests difficult. They are hesitant to enforce forestry programmes in the area for fear of incurring the tribal community's wrath. "Unclassed state forests," says one official, "have become a no man's land, subjected to open plunder." While tree permits are issued to harvest timber, little is invested for its management. The officials find it difficult to acquire this class of forest as the tribals perceive it as an infringement on their traditional rights. The relationship between the forest department and the tribals has always been antagonistic, since the department has the power to reserve vast tracts of forest land which means the abrogation of all customary rights. The tribals resent this. Says Chenging, a farmer of Poma village, near Itanagar, "Elephants do not pay royalty for uprooting trees in the forest. Why should I pay royalty?" Today, the demand for dereservation of forest land in Pasighat, Roing division, and some other areas is being articulated politically. Take Deomali township, in Tirap district, which developed within reserve forests covering approximately 200 ha of land. It will soon be dereserved. This area was developed in the 1960s when the chiefs of the Namsang and Borduria villages were persuaded to part with their hollong forest for reservation, on the condition that they would share the profits from the forest with the state. The forests around the district headquarters and the state capital are under the most pressure. These townships are facing an acute scarcity of land with built-up area slowly encroaching upon their green fringes, threatening the plantations raised by the forest department at some places. The story of Along town best illustrates this development. When this government outpost was established under the British, it was on land donated by Panya villagers. Today, the villagers resent the fact that outsiders are buying up their panikheti (irrigated terraces) land. They are now demanding plots in the town in lieu of agricultural land. The clamour for land in Along town has become so intense that the forest department's social forestry plantation here has been dug up to build houses. If the encroachment continues, the Gaur Hill Station Reserve will be completely destroyed. One reason for the increase in forest cover figures over the years is reduction in area which could not be interpreted because of clouds. In 1972-75, the uninterpreted area accounted for 23 per cent of the total area; in 1980-82 it came down to 6 per cent and finally, in 1985-87 to 2 per cent. In the 1987 assessment, the forest cover map was prepered on a 1:1 million scale while in the 1989 assessment it was made on a 1:250,000 scale. This greatly increased the accuracy of the assessment. The loss of forest cover is posing a serious threat to the fodder and energy resources of the villages. In and around the Nishi villages, in Lower Subansiri, the local Nishi herdpersons can be seen travelling long distances to graze their undernourished cattle. The chowriwallahs (graziers) of Tawang are very worried about the fact that the region does not have enough natural grasslands. After the 1962 Indo-Chinese war, a large tract of Tawang's grazing land was taken away by the army for construction of roads, bridges and bunkers. This has caused immense hardships to the local communities. Earlier, the chowriwallahs could move freely across the Indo-Tibetan border with their animals. Not any more. The Arunachal Pradesh government has adopted a policy of generating employment by dealing out contracts for road building. Of the state's total plan allocation, the public works department (PWD) gets 20.14 per cent. Another 38.4 per cent goes for transportation and communication. While it is important to develop communications in this difficult terrain, the system, based mostly on contracts and government sanctions, is getting increasingly corrupt. According to local sources, selection of sites for roads and measurement of angles for earth cutting on fragile slopes are often not in accordance with legal stipulations. As a result, roads get constructed in ecologically unsuitable areas. Lately, jhum, or shifting cultivation, which has been the dominant land use option in this region, has been severely criticised for causing land degradation and deforestation. In a given year, the area under shifting cultivation is about 51.42 per cent of the total cultivated area. According to a 1989 survey, the forest area affected by shifting cultivation has increased from 7.94 lakh ha in 1975 to 8.52 lakh ha in 1984 -- a 7.3 per cent increase. The shortening of the jhum cycle and increase in the number of persons resorting to jhum cultivation is also causing concern. In 1974, around 81,000 families were jhum cultivators; by 1984 their number had shot up to 107,000. By AD 2000, an estimated 1,55,000 families will be following this practice. Not surprisingly, foresters are alarmed at this development. B A Mathews, state conservator of forests, fears that large tracts of unclassed state forest could be destroyed because of this practice. While the shortening of the jhum cycle years in places like the Lower Subansiri has created vast deforested tracts, putting the entire blame for this on the jhumias is unfair. After all, there is extensive deforestation in certain tribal tracts like Tawang as well, where shifting cultivation is not practised. According to Tabom Babla of Babla village, Daporijo, the cropping pattern of jhum is ecologically sound. Besides, it ensures them nutritional sustenance in a very harsh environment. "We can grow a variety of crops in our jhum kheti which meets our daily dietary requirement," adds Mito Lollen, of Panya village near Along. Earlier, tribals depended on food gathering during the lean season to meet the shortfall in food production. In remote areas, the dependence on the forests for food is still very great. Given the difficult topography of the region, the plains dividing Assam and Arunachal Pradesh have become very sensitive because of ownership claims by the two states. People along the 740-km border region find themselves pushed out of their traditional niche by the constitutional boundary which materialised only after the transfer of land from the erstwhile North-East Frontier Agency (NEFA) to Assam, following a notification in 1951. According to J.E.Tangu, state home secretary, the 1950 earthquake led to a large number of hill people coming down to the plains. They cleared the forests and created new settlements. Once these settlements began to grow, people realised the implication of the notification. The limited fertile land and forest resources in the area became the source of conflict between the settlers on both sides of the border. In one such incident in the first week of last April, the Santhalis of Assam and the Nishis of Arunachal Pradesh clashed over the construction of a road linking Itanagar and Bhalukpung, which passes through the Behali reserve forest in Assam. A large number of houses were set afire, two persons were killed and several injured in a series of attacks and counter-attacks. Meanwhile, both states accused each other of encroaching upon the neighbouring state's area and attacking villages. So much so that Assam chief minister Hiteswar Saikia alleged that Arunachal Pradesh had encroached upon 45,213 ha of land in Assam's Sonitpur, Lakhimpur, Dhemaji, Sibsagar and Tinsukia districts. The rich forest wealth of the border area seems to have aggravated the problem further. P Lahan, conservator of forests of Assam, said that initially both the states had been tapping the timber resources of the area and, therefore, wanted to control these forest tracts. Each state has attempted to extend the constitutional boundary in its own favour. This conflict has led to endless litigations which resulted in a case being filed in the Supreme Court in April 1989. Finally, on August 31 last year, the two states signed an agreement resolving the dispute, but not to much avail. Apang, however, feels that this battle of attrition between the states will soon be over. He says, "We are hoping to come to an amicable solution soon. In the past, we have sorted out many problems on the basis of mutual understanding. There is no reason why we should not be able to do the same in the future." Apang's optimism may or may not be misplaced. But Arunachal Pradesh's survival hinges on whether its economy, which has so far been based on exploiting natural resources, can diversify. It is vital that the state reduces its dependence on resources which are basic to life-support systems, but will it be able to do this given the severe economic constraints it faces?